When I first started thinking about starting a nonprofit in Jackson’s memory, I did a lot of research. I didn’t know what I was doing or where I should start. I called lawyers for professional advice, I spoke to friends who work in development, and I prayed for guidance. Overall, the feedback I received was positive, but there were a handful of doubters. “If you aren’t raising millions of dollars, it isn’t worth your time,” some told me. Another literally laughed at my goals. And pretty quickly I started second guessing if I should do anything at all. But I knew in my heart this is what I wanted, and I kept going back to what Eric and I have said from the beginning. “If we can help one family, it’s worth it.” So I pushed forward with a stronger determination to create something positive from our loss. And here we are, a few weeks after our second Jackson’s Jam, and I’m left speechless. With the help of numerous sponsors, the community, and our family and friends, I am excited to share that our flagship fundraiser raised more than $18,000 this year! To some that’s not much, but to the people we will help with this money, it is everything. 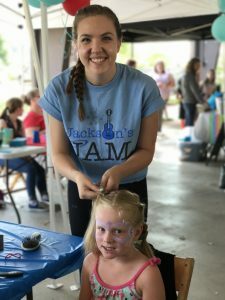 An event like Jackson’s Jam isn’t possible without an army of people pitching in to help. Thank you to the countless volunteers who shared their time with us. Thank you to the sponsors who believe in our mission and supported our venture financially. Thank you to all of the musicians for generously sharing your incredible talents with us. And thank you to the community who showed up and enjoyed a day full of fun, food and music! I would be remiss if I didn’t specifically thank Texas Roadhouse of Waukesha. You guys, the group of individuals at this restaurant is unbelievable! The morning of Jackson’s Jam, I caught their team in a little pow wow. The manager was sharing Jackson’s story and our mission through JR Hearts. There wasn’t a dry eye in the room. These men and women not only arrived early, stayed late and pitched in wherever needed, but they truly understood the reason we were all there. The day could not happen without Texas Roadhouse. So if and when you get a chance to dine out in Waukesha, I highly recommend spending some time at this fine establishment. Not only will you enjoy some great food, but the people working there are some of the best around! But then I think, what if this succeeds? What if we are able to relieve a family’s financial burden? What if we make a difference in this world one family at a time? I’ve realized these last few years, we don’t have to move mountains, but we can move one stone at a time and see where it takes us.